But luckily for you, Mick(ey) must have idolized Alex Kidd since his childhood days, as he's not afraid of ramming his fist into whatever's getting in his way, with varying degrees of success. 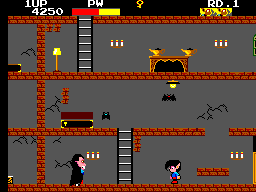 The objective of this game is to enter the (largely underground) house, punch (or jump on) bats, ghosts and fire-spewing tomatoes until a key gets dropped, then seek out one of the five coffins, open it up, kill the Dracula within and claim the jewel he was holding on to before repeating this process four more times. Once you've got the five jewels the house you're currently in has to offer, you need to find the exit and move on to the next round. Considering that this game has been released on a card, the graphics are okay. There's only few things where you're wondering what they're supposed to be (like the coffins), and even though the rooms look a bit samey, that's hardly detrimental for the game's appearance. There's one thing where I have to deduct points for, though, and that's the palette: Rounds 2 and 5 have a bright red sky and bright blue indoor walls, which simply looks awful. There's not a lot of music in this game. Only about four pieces, but they settle the mood perfectly. The title theme starts really quiet and gradually gets louder, building anticipation. The stage theme is a pretty catchy tune that's oddly fitting for the scenario of punching ghosts for keys and looking for coffins and supplies. Then there's the theme that plays when you fight Dracula and when you've cleared a stage, which is kind of a reprise of the title theme. It loops quickly, but dear God is it intense; like something you'd hear in a horror movie. The Game Over theme, on the other hand, is just that. A short jingle to tell you that you've failed. It doesn't sound scary, but that's just alright, as it can help lighten the mood after all that intense stuff you were put through -- if you aren't fuming with rage about the cheap difficulty by this point. The controls are pretty responsive. Button 1 jumps, Button 2 punches, and you can also crawl (although you can't jump whilst doing so, which is a bit of a loss). Ladders aren't a pain in the backside to climb, although it gets slightly cumbersome when you have another ladder right next to the one you just climbed up. The unresponsiveness comes once Mick(ey) gets shoved around by the monsters that are all over the place. Bats don't faze him much, but if he gets hit by ANYTHING whilst climbing a ladder, he falls off. 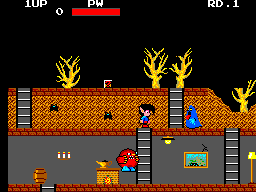 Even so, when Mick(ey) gets pushed all over by an enemy (particularly Dracula and the mummies you encounter after Round 1), you're completely at the opponent's mercy. He can take quite a beating, but once you're against a wall, your life meter will have turned completely yellow before you know it. It took me a while to get into the game, and once I did, I couldn't get enough of it. There's 3 rounds. After that, the game loops once more, and stuff gets harder. The levels are a good bit about exploration, particularly because the coffins are really hard to find at times. Overall, I'd say the game has some good replay value. Considering it's a card game, this is to be expected. 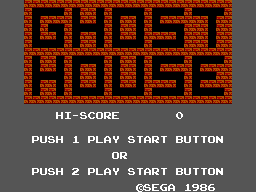 Ghost House is an alright game. Its learning curve is a bit steep, but once you've surmounted it you'll find it's quite an enjoyable experience. On the other hand, my stanards aren't particularly high, so you may not enjoy this game as much as I do. Nevertheless, it's at least worth a try.